Worried you’re going to be stranded at the roadside? Worry no more. 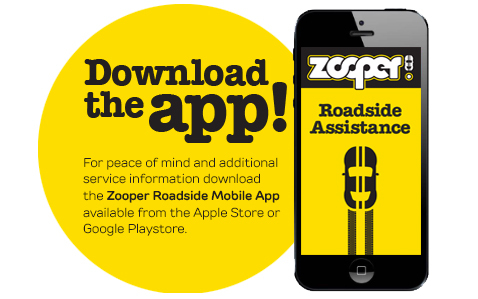 With the Zooper Roadside Assistance Mobile App you can rest assured that Zooper have got you covered – 24 hours-a-day, 7 days-a-week. Every car purchased through Zooper comes with 12 months Platinum 24/7 Roadside Assistance cover through National Roadside Assist. National Roadside Assist offers a nationwide emergency breakdown program with over 1700 service providers in our network, on call 24 hours, 7 days a week delivering peace of mind motoring with quality road rescue services. It's zooper and it's free!